It's been about a month now since we set up our aquarium. During Bronte's naps, I've been testing the water parameters in our aquarium--ammonia, nitrites, nitrates, & pH--with the little test tubes & drops from various bottles of chemicals that I compare to colour charts to assess levels. I've been adding ammonia, fish food, Seachem Stability (bacteria in a bottle), as well as treating the tap water with API Tap Water Conditioner when I filled the tank. I also put in a handful of gravel from a friend's established aquarium as 'seed material' to get our little colony of nitrifying bacteria going. If you're wondering why I've suddenly taken up chemistry & haven't put any fish in the tank yet, it's because we're trying to get the water quality just right & grow our biological filter (a colony of bacteria that help improve the water quality) before adding fish. You can do this with fish in the water, but the level of ammonia & nitrites that can build up in the water while the process happens can be harmful & even deadly to the fish. Our fishless cycle is well on its way--the tests are showing that the nitrosomonas can convert about 6mL of ammonia in 24 hours. However, we're still waiting for the population of nitrospiros to increase, who will convert those nitrites produced by the nitrosomonas to nitrates. Basically, once I start to see the ammonia & nitrite levels both dropping to zero within 24 hours of adding a dose of ammonia, the cycle is complete & we are ready for fish! Though the cycling has been going fairly well since getting the bacterial boost from the other aquarium, there was a mystery. 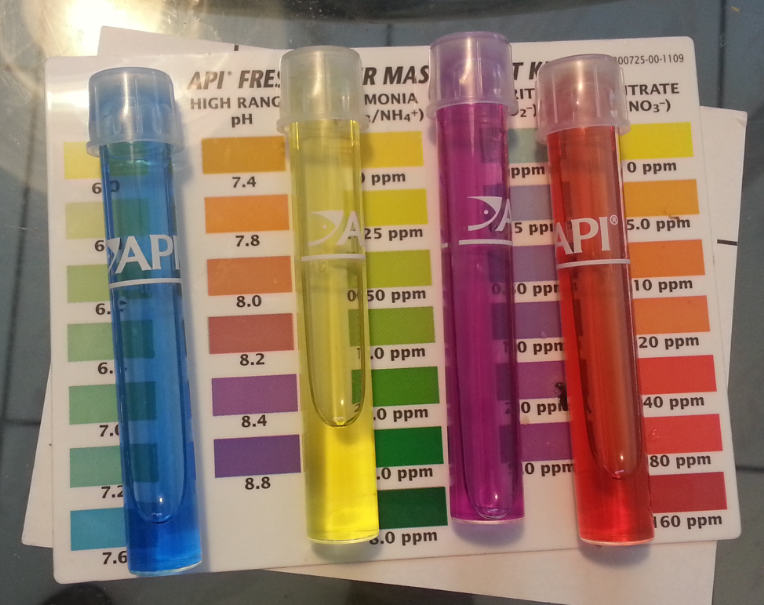 I tested the pH of our tap water & discovered that it had a relatively low pH of 6.6 or 6.8. I knew Vancouver had soft water, so I wasn't surprised. I started thinking of all the Amazonian species that would thrive in a lower pH, like neon tetras. Then I tested my aquarium after setting it up. The pH was consistently 7.6-8. I did some reading online & decided not to mess with it, as that pH, while not ideal for the fish I had in mind, wouldn't harm the bacteria during the fishless cycle. Still, it's weird to see such a change when there's virtually nothing in the tank. Gravel, a rock, the filter media--none of these should have changed the pH. Red, yellow, blue, & purple mean progress! After some googling & conversations in the Aquariums subreddit (thanks anonymous fishy internet peeps! ), I tried testing the tap water after sitting out for a while, then after dosing it with the API Tap Water Conditioner. I put in what I think was the proper dose of water conditioner & tested the pH. Little to no change. Then I added a bit more, realizing that I may have gotten my math wrong & overdosed the tank when I set it up. Yup. pH skyrocketed (see the blue vial in the picture over there?) with just a bit more of the water conditioner. Mystery solved. Next step is either waiting til the cycle is complete, or getting our live plants. I can't decide which. I think I may get the plants sooner, rather than later, since I'm getting tired of staring at an empty tank. We had aquariums for about 2 years. I never could get the tank balance regardless of all the stuff I did. It was horrible. I finally decided to stop after realizing how many fish we were killing. I hope you have better luck! Yeah, it's tricky with aquariums, because you're sort of playing God--you control every single aspect of their little world. There are a lot of things that can go wrong. When I had aquariums in my teens, I inadvertently killed a lot of fish too, mainly due to ignorance. My last tank I had a gold severum--a type of fairly aggressive cichlid--in with a bunch of other peaceful community fish. It ate everything else in there eventually. This time I have access to so much more information (I had those tanks before the internet was really a thing) so I think I'll probably avoid a lot of the same mistakes.